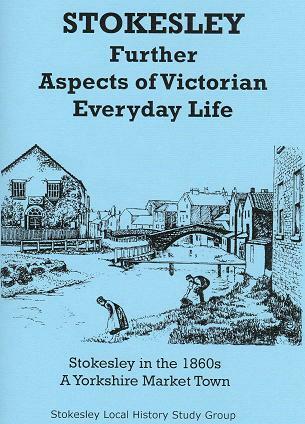 £5.95 plus £1 p&p - special offer of £10 plus £2 p&p includes this publication plus "STOKESLEY - Aspects of Victorian Everyday Life"
This builds on the details provided in the volume "STOKESLEY - Aspects of Victorian Everyday Life"
Chapters include : Art and Entertainment, Poverty, Education, Law and Order, Freemasonry, Friendly Societies, Religion. The research which has gone into this publication is tremendous, with quotations from newspapers of the time. Where else could one read of "JM, carter, Great Ayton, was charged by PC Lowther with riding his wagon without reins, after having been cautioned. Fined 10s including costs." Or of "Joseph Grey, late of The Black Swan Inn, was charged by George Harker, Superintendent of the Railway Police, with having been smoking on the platform of Stokesley Station." Stokesley was ahead of its time in education, with a schoolhouse, built by public subscription, on land given by Bradshaw Pierson in 1734, even though education was not compulsory until the 1870s. Another Stokesley resident, John Preston, decreed in his will of 1805 the sum of £2,000 to be invested in Government Bonds, and the annual income from it used "in building a new school or enlarging the old one and afterwards in paying the schoolmaster duly qualified in teaching the classics, English, writing and arithmetic." This caused quite a bit of contention in his family when he died in 1814, but the Trustees carried out his wishes, and when the court case was settled the investment had increased to over £4,000. This is quite a lot of money even by today's standards, but in the 1860s it would have been a small fortune. The school is still standing, and is now a fast food outlet. Stokesley also saw the prelude to the establishment of the origins of local government with the formation of a Friendly Society in 1744. By 1833 the Oddfellows had opened a lodge in Stokesley and by the 1860s the lodge was prosperous and played an important part in helping one another. A collection at a local church raised £12.13s2d for the widows and orphans - a substantial sum in those days. Beautiful illustrations again drawn by our member Estelle Scott complement the text, and although it could be a valuable asset to local and family historians, it will also appeal to anyone who wants a "good" read.